Most of us are unaware of the hidden world of mathematics. Actually, we’d rather avoid the subject entirely. It’s difficult and inaccessible. A lot of that has to do with the way we’re introduced to mathematics as taught in school and university. A reader sent me a pointer to Frenkel’s book after reading 17 equations that changed the world. And I’m glad they did. Math is a way to describe reality and figure out how the world works, a universal language that has become the gold standard of truth. In our world, increasingly driven by science and technology, mathematics is becoming, ever more, the source of power, wealth, and progress. Frenkel argues that mathematical knowledge can be an equalizer. Mathematical knowledge is unlike any other knowledge. While our perception of the physical world can always be distorted, our perception of mathematical truths can’t be. They are objective, persistent, necessary truths. A mathematical formula or theorem means the same thing to anyone anywhere – no matter what gender, religion, or skin color; it will mean the same thing to anyone a thousand years from now. And what’s also amazing is that we own all of them. No one can patent a mathematical formula, it’s ours to share. There is nothing in this world that is so deep and exquisite and yet so readily available to all. That such a reservoir of knowledge really exists is nearly unbelievable. It’s too precious to be given away to the “initiated few.” It belongs to all of us. One of the key functions of mathematics is the ordering of information. This is what distinguishes the brush strokes of Van Gogh from a mere blob of paint. With the advent of 3D printing, the reality we are used to is undergoing a radical transformation: everything is migrating from the sphere of physical objects to the sphere of information and data. We will soon be able to convert information into matter on demand by using 3D printers just as easily as we now convert a PDF file into a book or an MP3 file into a piece of music. Frenkel beautifully explains our cultural aversion to math. You can appreciate math without studying it. [M]ost of us have heard of and have at least a rudimentary understanding of such concepts as the solar system, atoms and elementary particles, the double helix of DNA, and much more, without taking courses in physics and biology. And nobody is surprised that these sophisticated ideas are part of our culture, our collective consciousness. Likewise, everybody can grasp key mathematical concepts and ideas, if they are explained in the right way. To do this, it is not necessary to study math for years; in many cases, we can cut right to the point and jump over tedious steps. The problem is: while the world at large is always talking about planets, atoms, and DNA, chances are no one has ever talked to you about the fascinating ideas of modern math, such as symmetry groups, novel numerical systems in which 2 and 2 isn’t always 4, and beautiful geometric shapes like Riemann surfaces. It’s like they keep showing you a little cat and telling you that this is what a tiger looks like. “People think they don’t understand math, but it’s all about how you explain it to them. If you ask a drunkard what number is larger, 2/ 3 or 3/ 5, he won’t be able to tell you. My dream is that all of us will be able to see, appreciate, and marvel at the magic beauty and exquisite harmony of these ideas, formulas, and equations, for this will give so much more meaning to our love for this world and for each other. Love and Math is a book about mathematical love. 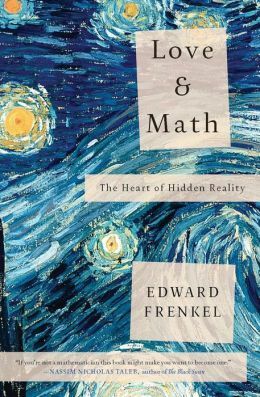 Frenkel offers the reader a glimpse into the beauty of mathematics with the Langlands Program, “one of the biggest ideas to come out of mathematics in the last fifty years.” In so doing he exposes us to the sides of math we don’t get to see often: inspiration, profound ideas, and beautiful revelations.